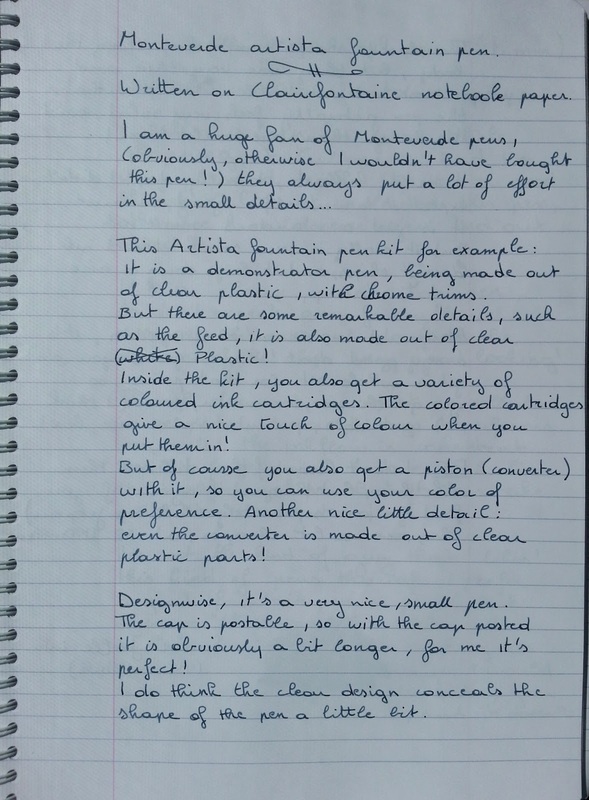 I am a big fan of Monteverde pens, I think they do a great job on the making every detail of their pens just right! 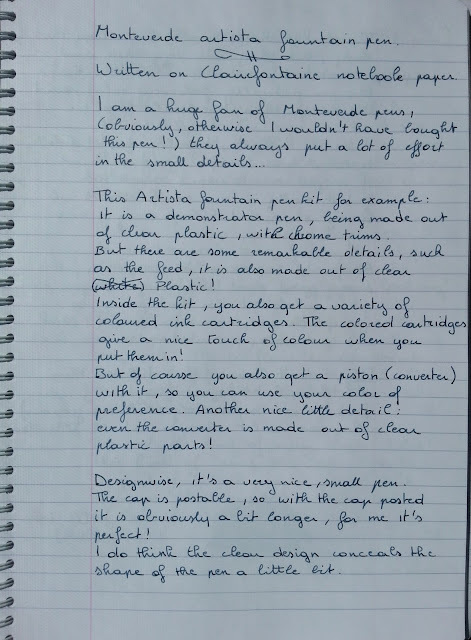 They make a lot of very traditional looking pens, though they always have that little Monteverde-touch! 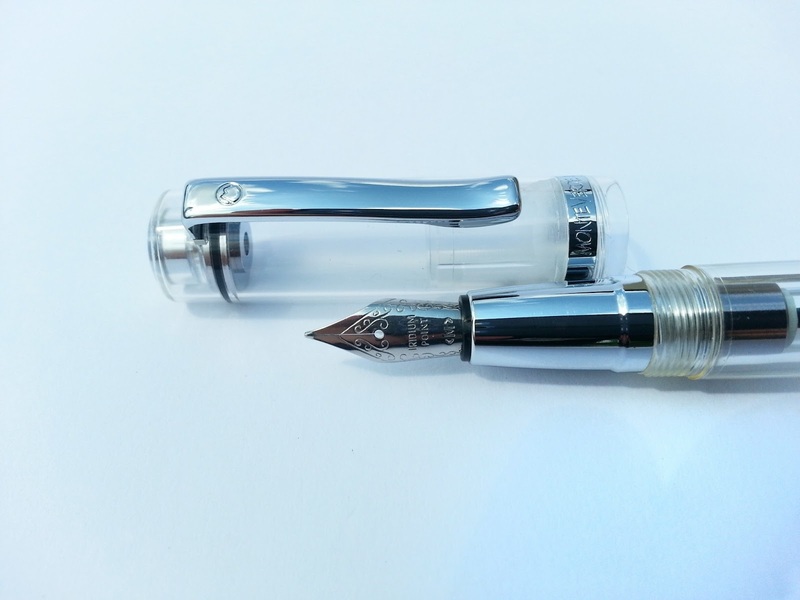 This artista fountain pen kit for example: it is a demonstrator pen, being made out of clear plastic, with chrome trims. But it has some remarkable features, like the clear plastic feed, which looks very cool, and I never saw one before. 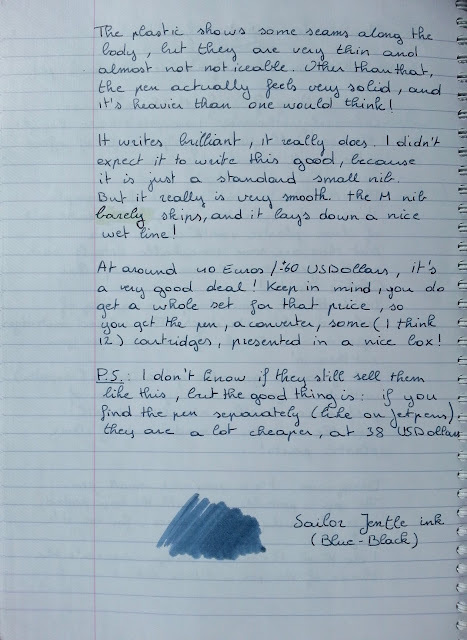 Or the fact that they sell them in a kit, where they include a little container with a variety of coloured ink cartridges, so when you put a different colour in it, and because it is a demonstrator, the pen itself gets another colour as well! 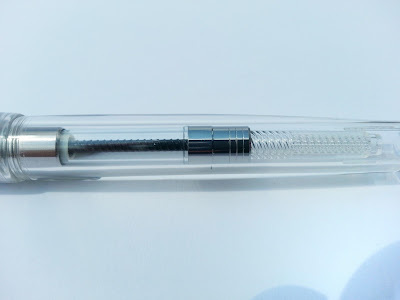 But they also include a converter, so you can fill it up with your favourite ink, a cool thing about the converter: all plastic parts are also made out of clear plastic! Designwise, it's a pretty small pen. 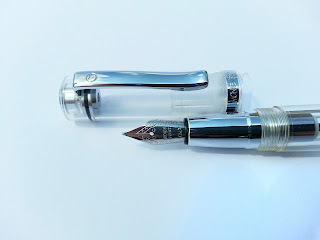 (not nearly as small as a Kaweco though!) But you can post the cap, so it gets a little longer. For me personally it is the perfect size with the cap posted. The plastic shows some seams along the body, but they are very thin, in fact they are almost not noticeable when in use. 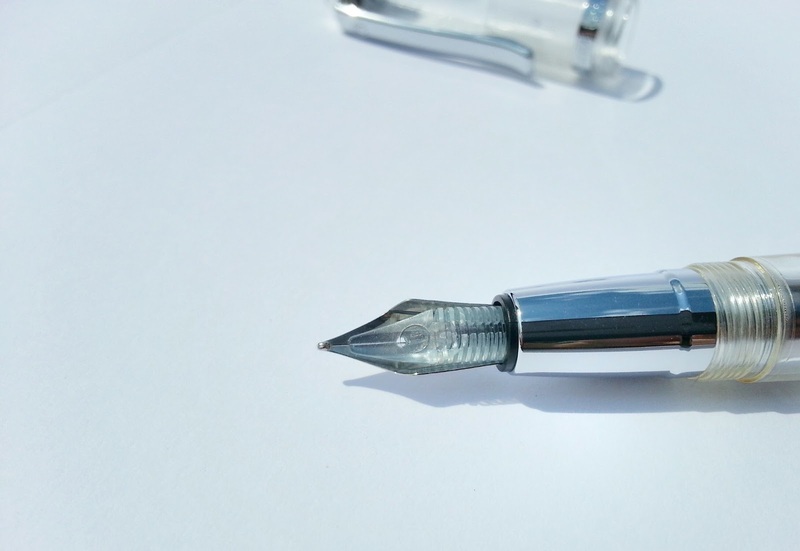 I do think that the clear plastic conceals the shape of the pen a little bit though! 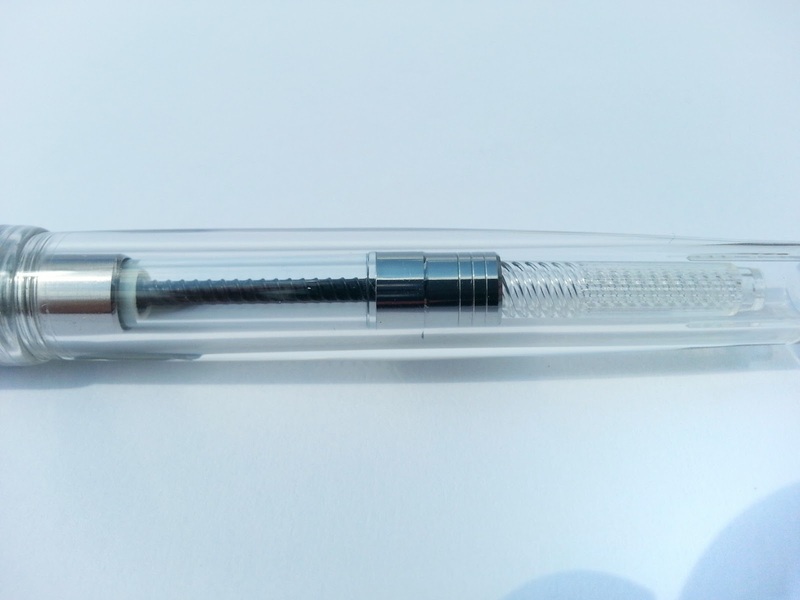 But I guess that's pretty normal when almost the entire pen is made out of clear parts! Surprisingly the pen feels heavier than one would think, because of the metal parts in the cap, but that's a good feature, because the weight actually makes it feel much more solid. 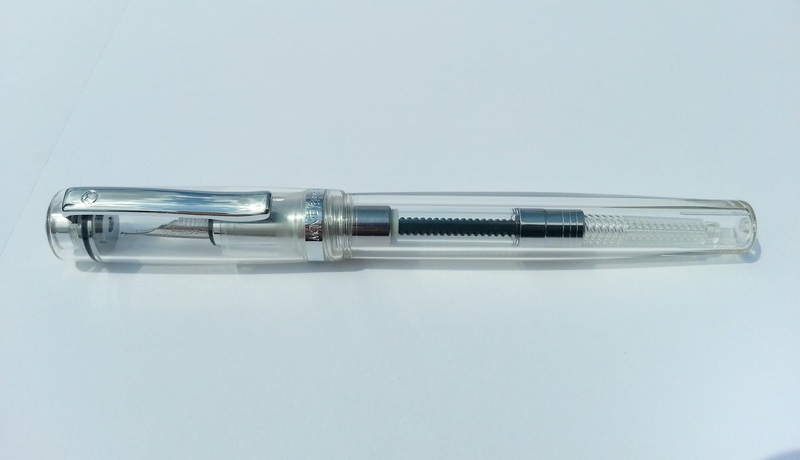 It writes even better than how it looks, it is just a plain, standard, small nib but it writes surprisingly well! The M nib barely skips, and it produces a very nice wet line! At around 30 Euros/ 40 USDollars it 's a pretty good deal. Considering you get some different coloured cartridges as well , which makes it a great gift for people who are new to fountain pens! Note: I don't know if they still sell them as this 'kit' with coloured ink cartridges!